My oldest Ella loves shrimp, I mean really LOOOVES it! I have an aversion to raw meats in general though, so the thought of raw seafood has always really freaked me out...and I therefore have never prepared it at home, except for the occasional fish dish. When figuring out what to make for our back to school dinner I saw this (on The Pioneer Woman Cooks) and knew Ella would love it, so I decided it was about time to give it a try, for her sake :-). It wasn't actually bad at all, although de-shelling the shrimp to eat them was a pain and I think the recipe would still be delicious if they already had their shells off, so that's what we'll do next time. And there will be a next time! Ella and I were browsing food blogs looking for a yummy dessert for our back to school dinner and she kept picking out really fancy cakes, that frankly scared me! 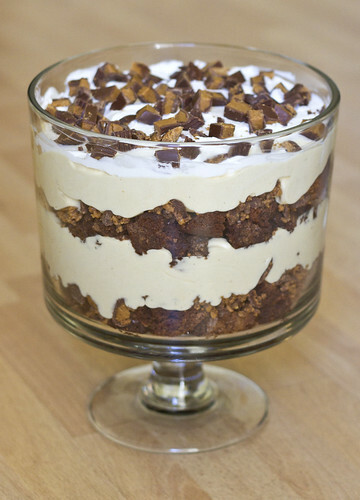 Then we saw this Peanut Butter Cup Trifle on The Sister's Cafe and were sold! I remembered I bought a trifle dish at my last Pampered Chef party and still needed to break it in. And the dessert? It was DELICIOUS!!! I mean, how can you go wrong with brownies, PB cups, and a creamy peanut butter layer?! It was a perfect recipe for little helpers to assist with as well. SOOO good...and SOOO easy! 5-6 peanut butter cups to garnish. Combine pudding and milk. Beat for 2 minutes. Add peanut butter and vanilla, beat until smooth. Gently fold in 2 cups cool whip. 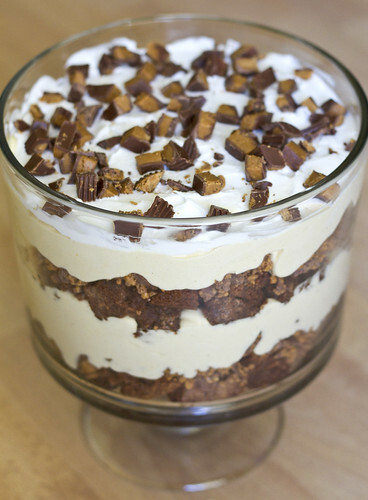 Layer in trifle dish ½ the brownies, ½ the crumbled peanut butter cups, ½ the pudding mixture. Repeat. Top with cool whip and peanut butter cups. (Or shaved chocolate curls) Chill until serving. This recipe came up on The Pioneer Woman Cooks while I was planning Ella's Mexican-inspired birthday dinner, so they were a perfect fit! 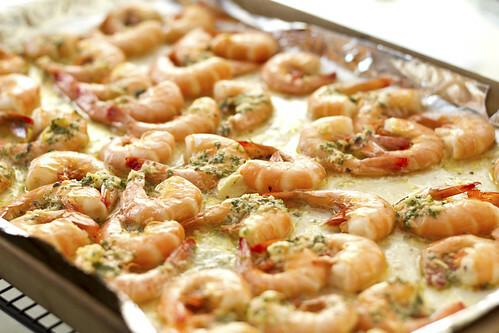 They were great for a party because I could prepare them the day before and they were also delicious, which is a must. I was slightly traumatized when I had to buy a ham hock, but I think I'll get over it eventually...maybe after eating some more yummy beans :-). Rinse beans under cold water, sorting out any rocks/particles. Place beans in a stock pot with the ham hock and cover with water by 2 inches. Bring to a boil, then reduce to a simmer. Cover the pot and simmer for 2 hours, checking occasionally to make sure the water level is fine. Add more water as needed (I had plenty). Then throw in diced onion, red bell pepper, garlic and jalapeno. Cover and continue cooking for another hour or two, remembering to check the water level. 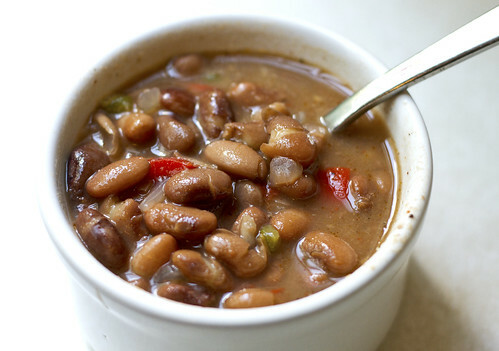 Add salt, chili powder and pepper, then cover and cook for another 20 to 30 minutes, or until beans are lovely and tender. Serve with cornbread as a meal, or spoon on top of nachos, tacos, etc. I was lucky enough to have the opportunity through the Foodbuzz Tastemaker program, with KODAK Gallery, to create a photo book. Having just returned from my trip to Oregon for a roommate reunion, I thought it would be the perfect subject for my book! The process of making the book through Kodak was really simple and within an hour, I was ready to order my finished product! I just uploaded the photos from my trip (you can even upload them from your facebook page), picked a page layout and dragged and dropped in the pictures. You can view mine here. Kodak Gallery is also providing an exclusive offer to my readers; 40% off a medium hardcover or a large Photo Book. Just go to HERE to make your book. The offer expires 8/31/11. Bean Salad, Yam Vegetable Stew, Artisan Bread, Vegetarian Enchiladas, Baked Salmon, and Roasted Rosemary Vegetables. This is the last of the recipes from my Oregon trip with my old college roommates...kind of sad! Kim paired these delicious roasted veggies with her baked salmon and it was perfect. 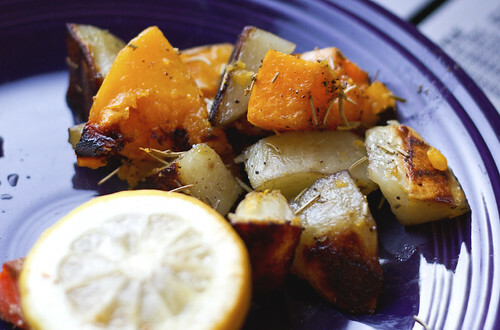 I love anything roasted, and especially loved the rosemary! I guess I better get cooking again so I have something else to post :-)! Peel and dice as much butternut squash and potatoes as you like. Toss them in olive oil, garlic salt (or garlic powder and regular salt), pepper and rosemary. Cook in a 400 degree oven for about 40 minutes (or until tender). After just recently trying salmon for the first time (and really liking it! ), I was excited when Kim told us she would be making some salmon for one of our meals! I was definitely inspired to try it on my own after trying her delicious "recipe". It was so simple, yet the salmon was so flavorful. Mmmm, this makes me want more! 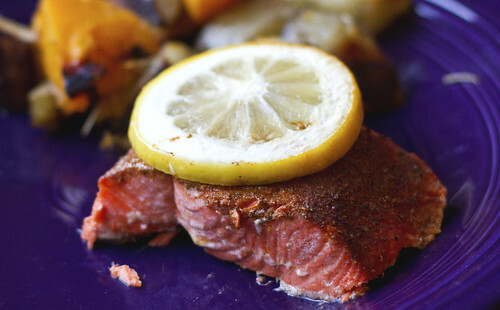 Cut salmon into single serving portions and lay on paper. Thinly coat with olive oil. Generously season with Old Bay. Lay sliced lemon on top, then pop in a 400 degree oven for about 25 minutes. This was my favorite food picture from the trip...it is definitely a pretty dish with all the colors! This stew was so flavorful and filling that I didn't miss the meat at all (and I thought it was great eaten plain without rice, bread, etc. to go with it). Saute onion in oil, add curry powder, serrano pepper and ginger, saute until onion soft. Add Carrot, garlic, yam, saute on medium until carrots begin to soften. 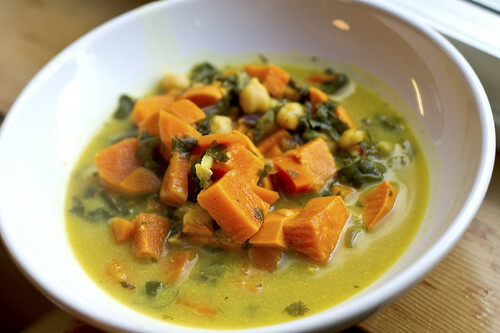 Add coconut milk and broth/water, and beans/protein, if using chard, kale or beet greens throw them in now. Cover and cook until yam is soft, then stir in cilantro, tumeric, lime juice, and salt and pepper. If using spinach stir that in at this time. Serve over rice, cous cous, or quinoa. I am definitely not a bread making expert, but Sara whipped up this delicious bread for us and it was divine. 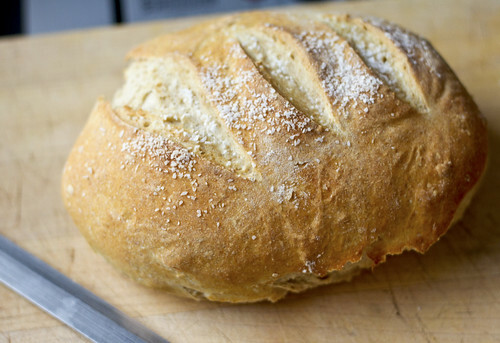 I loved the salt on the crunchy crust, especially in contrast to the soft, fluffy inside. Plus, it was so pretty! I am determined to master this recipe for myself! with a towel and let the dough rise for 2 hours or so. the dough finish expanding. Our dough usually gets used in a few days. degrees (every oven's different - 425 works well for us). nice crisp crust. Bake the bread for 20-30 minutes. Done. 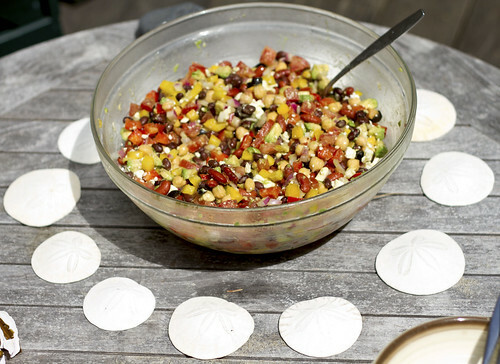 This is the first of the recipes from my Oregon beach house trip. I got to spend the weekend with my roommates from college and we took turns with the meals while there. Although everything was absolutely delicious, I think this may have been my favorite...I couldn't stop eating it! I loved everything about it - the pretty colors, the crunchy peppers, the creamy cheese and avocado, the tang from the limes, etc. 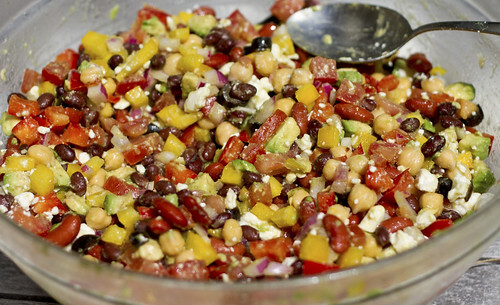 This is perfect to share for lunch and filling enough to be dinner too. We ate it with tortilla chips, but you can serve it over rice, in tacos or quesadillas, or whatever your heart desires. I also had to include this pictures because Sara had arranged the sand dollars so nicely around the bowl :-). 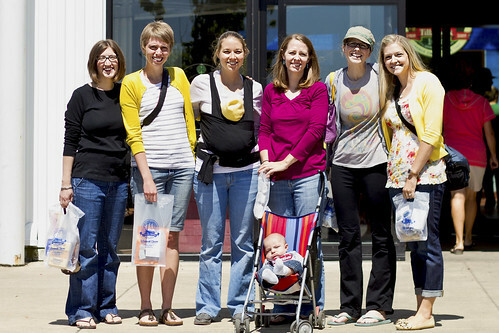 We were in full sunlight outside so the pics didn't turn out great.